He failed to resist the urge to scratch at the collar a few times while the watched, hating the feel of it, of the way it dragged on his neck and connected him to Danai. He wanted to scratch at the muzzle, too- it was too loose, and it chafed and rubbed at him- but he had a realistic idea of the response it’d generate. He thought it might be best to leave it on and hold fast to the idea that he could scratch it off if he wanted to. Not so much the collar, though. As they went through the concrete hallways Mhumhi noticed that they gradually got less featureless. Boards and paper showed up on the walls, then colors. The number of hulkers roaming around increased, and they seemed less startled by his presence. Perhaps it was the leash, but with the double takes he was getting from many of them, Mhumhi suspected they thought he was a small, oddly-colored hyena. Danai told him a bit more about the place as they walked. “Oh,” said Mhumhi, who hadn’t a clue what that meant. “I’m afraid I don’t know what that is,” said Danai, and Mhumhi belatedly remembered she wouldn’t have knowledge of the city above. He changed the subject. “I’m not the only one,” said Danai. “But I learned it because that is my job. I’m a linguist, so I learned many different languages. Dog is one of them. I never thought I’d have to use it, though…” She made a sort of face, wrinkling her nose. At this Danai stopped in her tracks and raised her hand to smother a laugh. All of the other hulkers around looked at her oddly. “What’s so funny?” asked Mhumhi, annoyed- not only was she laughing at him, her stopping had meant that the collar had yanked back on his neck. She seemed to sober as she said the last, her lips pressing together, and began walking again. Mhumhi had to trot to catch up. There was a certain finality to her words, and Mhumhi did not press her. He thought she sounded rather sour about it, and there was something in the way she said us. But he did not dwell on it, for just then something pricked at his nose, something intimately familiar. He raised his head and took a deep sniff, stumbling a bit as Danai kept walking, and wagged his tail. He forgot himself and lunged forward, nearly taking Danai off her feet as he tugged. She stumbled and waved a hand at the other hulkers, who had rushed forward. Mhumhi dragged her down the hall, uncaring, wagging his tail furiously, starting up chittering and whining. He heard Maha’s muffled voice before he saw her, and turned to drag Danai to a door painted with many colors. Before he got to it, it swung wide open, and there stood Maha, beaming at him. Her smile dropped almost at once upon seeing him. Behind her an adult hulker ran up and took a frantic grab at her, but Maha ducked out of her reach and knelt in front of Mhumhi. Mhumhi merely whined and wagged and put his paws on her thighs to knock his muzzle against her face, feeling gladder than he ever had to see anybody. Maha, ignoring the shouts of the other hulkers- including Danai- reached out and unsnapped the muzzle from him, letting it drop on the floor. “Why’d they do that?” she asked. “Why’d they put that thing on you?” He saw her eyes getting wet in the way that they did before she cried, and quickly he licked around them. Maha didn’t say anything, merely curled her fingers into his fur, pushing them underneath his collar. “I hate them,” said Maha, without elaborating. He took that and her stubborn expression to mean yes. “Yes, and I hated it,” Maha informed him. Her face had taken on a particular set look that he recognized from when he’d made her particularly mad. It warmed his heart a little to think that she’d been giving the hulkers a very hard time. He gave her forehead a lick. Before she could comply, the hulker behind them gave a sort of gasp and then started babbling rapidly, shaking her head. Mhumhi had nearly forgotten about her and the others- the audience all watching him reunite with Maha. His wagging tail slowed somewhat. Danai was talking to the frantic hulker, and she seemed about to say something to Mhumhi, but before she could Maha spoke. Maha’s eyes went very narrow, and her lips thinned. Danai pushed her lips out and scratched her head. Mhumhi opted to say nothing, though he was feeling very in love with Maha at the moment, if not a tad annoyed, as he did want to go see Tareq. Danai spoke to the other hulker for a moment, gesticulating in the way that she had in the cage room. The other one kept shaking her head, and Danai looked down at the pair of them again. Mhumhi wagged to show his agreement, thinking that it wouldn’t be a hard order for him to follow. Maha gave a small smile and rose to her feet. “Back here,” she said, tugging on his collar, and led him by that, ignoring Danai’s presence at the other end of the leash. The room was large and surprisingly airy for concrete, with a patterned carpet on the floor and many small plastic things scattered around. Mhumhi tried to pause and sniff a couple, but Maha kept a firm grip on him and steered him firmly forward. At the end of the room there were a bunch of beds, and he could see the lump that was Tareq lying on one of them. Maha let go of his collar so he could rear up, wagging, and lick the boy’s sleeping face. Tareq awoke with a whimper, as was his way, but when he saw Mhumhi his eyes widened. 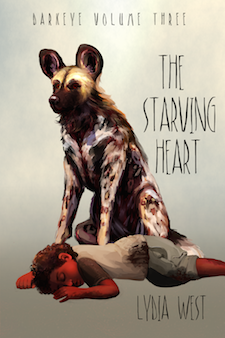 Mhumhi smiled at him and wagged his tail fervently. He was definitely feeling fonder of him after the display of loyalty he’d showed in the concrete dome. Tareq sat up, pushing back the blankets, and Mhumhi noticed something white was wrapped around his neck. He pawed at Tareq’s shoulder so that he leaned forward and sniffed at the back of it. It smelled faintly of blood. “Why’s he wearing a collar? Why’s he hurt?” he demanded, his tail going stiff. “Oh,” said Mhumhi. Now that he thought of it, he did remember seeing a culpeo biting Tareq’s neck in the frenzy of the night before- Maha had small wounds and bite marks on her lower legs as well. He licked Tareq’s bandage over the wound. One of the hulkers made a soft noise and muttered something. “She says not to do that,” translated Maha. Mhumhi gave the spot another lick for good measure and then withdrew, letting Tareq sit up again. Mhumhi glanced back at the female hulker that was quivering in the far corner. He was beginning to get an inkling that Maha might have had something to do with his rough treatment. “Where’s red dog?” asked Tareq. It startled Mhumhi to hear him speak so suddenly and clearly, but Tareq was sitting up and staring at him, an expectant look in his eyes. “Kutta…” Mhumhi trailed off. He hadn’t even thought of her since getting out of the car, and the last he’d seen of her, she’d been running behind them, trying to catch up… Sudden worry seized him. How far had she tried to follow them? Was she all right, in Oldtown, with the small dogs united against their pack? Maha caught his eye- she’d seen Kutta chasing after the car too- but said nothing. Tareq seemed satisfied by his answer, or however much of he’d understood. He started lying back down, tugging on his blankets. Maha went to help cover him again. Tareq said something in the liquid hulker language. Maha translated, biting her lip. Mhumhi could say nothing to this, so he merely gave Tareq’s nose a final lick and got down on all fours again. Behind them he saw that Danai had taken out her plastic thing again and was fiddling with it with the hand that was looped through the leash. When she saw them looking she put it away and smiled. “I suppose,” said Mhumhi. At once Maha grabbed his collar again. “Do you have enough food to share with both of us?” Mhumhi asked guardedly. Danai laughed. The words made Mhumhi somehow less rather than more reassured, but they had sparked something in Maha, who was looking at him eagerly. “All right, let’s go,” he said. She scratched underneath his chin. “No muzzles if you’re gonna eat,” she said proudly. Danai gave her little laugh and shook her head. “I suppose,” said Mhumhi, wondering at her odd tone. “What do you mean by that?” Mhumhi asked, bewildered, glancing at Maha, who’d stopped to examine something on the wall. She was smiling, but her eyes were not, and they were trained on Maha.